WASHINGTON – Pope Benedict XVI has accepted the resignation of Archbishop Oscar H. Lipscomb, 76, of Mobile, Ala., and has named Bishop Thomas J. Rodi of Biloxi, Miss., as his successor. The resignation and appointment were announced in Washington April 2 by Archbishop Pietro Sambi, apostolic nuncio to the United States. Archbishop Rodi will be installed as Mobile’s archbishop at the Cathedral of the Immaculate Conception in Mobile June 6. The 59-year-old archbishop has led the Biloxi Diocese since 2001; Archbishop Lipscomb has been Mobile’s archbishop for the past 28 years. The Vatican has also named Archbishop Rodi as apostolic administrator of the Biloxi Diocese until another bishop is installed. “I am both honored and humbled by our Holy Father’s appointment to serve as archbishop of Mobile,” Archbishop Rodi said in an April 2 statement. Archbishop Lipscomb submitted his resignation to the pope in 2006 when he turned 75, the age at which canon law requires bishops to turn in their resignation. He will turn 77 Sept. 21. He said he was “grateful to Archbishop Rodi for accepting this new charge,” and described him “as no stranger” to the Mobile Archdiocese because of his familiarity with the area as a native of New Orleans and bishop in neighboring Biloxi. Archbishop Rodi earned a bachelor’s degree from Jesuit-run Georgetown University in Washington in 1971 and a law degree from the Tulane University Law School in New Orleans in 1974 before entering Notre Dame Seminary in New Orleans, where he received a master of divinity degree in 1978. After being ordained in 1978 for the New Orleans Archdiocese, he was an associate pastor at three parishes. In 1986 he earned a licentiate in canon law from The Catholic University of America in Washington and was a professor of canon law at Notre Dame Seminary from 1986 to 1995. In the New Orleans Archdiocese, he was director of the Office of Religious Education, executive director of the Department of Pastoral Services and archdiocesan chancellor. He also served as vicar general and moderator of the curia. 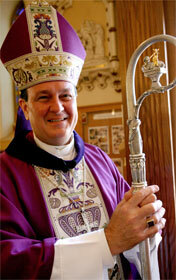 His episcopal ordination and installation as bishop of Biloxi was July 2, 2001. Archbishop Rodi currently serves on the U.S. Conference of Catholic Bishops’ Subcommittee for Home Missions, Committee for Canonical Affairs and Church Governance, and the Priorities and Plans Committee. He is a former member of the Committee on the Protection of Children and Young People. The Archdiocese of Mobile has a Catholic population of 67,351, about 4 percent of the total population of 1,680,384. It includes the lower 28 counties of Alabama and has 76 parishes and 11 missions.